Contents Everyone L-O-V-E-S Da Party Bus... You will also! Day or night, scheduled trip or charter, we're the folks who deliver the most memorable partying of your St. Maarten vacation. On the island celebrating a Birthday, Honeymoon, Anniversary, or just feel like partying, this is the best way to do it while on St. Maarten. We will pick you from your hotel and bring you back safely at the end of this tour. Come and experience our island’s nightlife. Bus stops at three bars per tour. Great music and entertainment on board. This tour sells out fast, so book your seat today and have a night you will never forget. 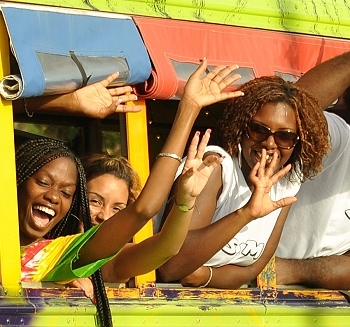 “Da Party Bus” Excursion offers our guests the perfect combination of nature, culture, and beach island fun. According to our customers, this is not a normal island tour; this is the ultimate family adventure and party experience. Our objective is to give visitors an unforgettable experience consisting of a panoramic island tour to significant spots on the Dutch and French sides of the island while having serious fun in a safe and controlled environment. On Da Party Bus passengers will have a guaranteed unforgettable adventure with a hand-picked driver and entertainer who knows the island better than anyone. Duration of tour: 4 hr...10:00 am to 2:00 p.m.
Itinerary: Tour starts at AC Wathey Cruise Facility and heads through Sucker Garden to the French side of the island. On this journey, you will be educated on some of our historical landmarks such as the Freedom Statue, Great Salt Pond, and the Border Monument as we make our way to the LOOK out point then onto Orient Beach. At our Famous Corolita LOOK out POINT you will get the opportunity to experience nature’s beauty first hand (10- 15 minutes). After boarding the bus, the party begins on our way to Orient beach. At Orient Beach, we will make a lunch stop stop (40-45 minutes) before heading to the Capital of French St. Martin. Marigot: After boarding the bus, the party continues on the way back to the Dutch side of the Island. Before crossing the border we will pass through the village of Sandy Ground and The Lowlands, home of many wealthy and some famous people. After crossing the border, we enter the Cupecoy area on our way to Sunset Beach Bar. At Sunset Beach Bar, we stop for 1 hour. Here you can enjoy a swim while having 747s and other heavy aircraft literally fly over your head as they land at Princess Juliana International Airport. Note: Depending on conditions, at times the beach might be void of sand. After leaving the Sunset Beach Bar area, we then head back to the ship where we bring Da Party Bus experience to an end. Note: Lunch is not included in our tour price; restaurants are reasonable. No minimum age requirement to board this tour however, to consume alcohol, all persons must be 21 years or older. A minimum of 8 persons per tour is required. This excursion is not recommended for handicapped or guests with physical or medical conditions. 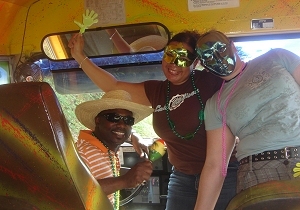 Daytime charters aboard Da Party Bus take you wherever you want to go, for kids of all ages. We've done dozens of special events, so if you're not sure of exactly what to do -- chances are we'll have a suggestion that fits perfectly. We develop parties suitable for all kinds of celebrations, whether its for your grandchildren or a few long-time friends. Make a reservation and join Da Party! See our Gallery for more. All nighttime bar hopping begins promptly at 7:00pm. We'll be back at the parking lot at about 12:00am. All bar hoppers are identified with a wristband. We're bar-hopping, and at bars lots of folks make up fictitious names. So, why not us? We do it strictly for fun though. Everyone will be given a name tag with a name you'll use on the bus - that's your name for the night. If you are caught calling anyone by any name other than what's on their name tag, you will be … well, you'll just have to come and find out! Age to party at night: 18 to 118 years. Pick the best Party Bus dancer. What happens to the winner? Come and find out! Learn the Party Bus Dance. (You'll love it.) Bring your dancing shoes! Limbo. Hey Mon, this is the Caribbean! Wildest Person / Couple gets a gift at the end of the night. Much More that you'll learn about on board!